It’s dark, concrete surrounds, and there‘s a line of riot police wearing smiley faces. London’s Banksy has painted one of his signature ”weapons of mass distraction“ murals on the walls of this downtown industrial warehouse, into which a stream of young urban bohos slowly pours. Keyboardist Money Mark is scheduled to vamp it up later, but right now the Funky President is holding court — J Rocc of the Beat Junkies. With fellow Junkie Rhettmatic waiting in the wings, J Rocc makes it look ridiculously easy, mixing one-handed so he can smoke a cigarette. Like Banksy‘s blend of pop iconography splayed on the walls, J Rocc is a one-man soundclash, bringing together everything from obscure ’70s funk to exclusive hip-hop remixes, his body in perpetual motion as he fluidly adjusts pitch, volume and fidelity. A 15-minute trip up the I-5 later, and J Rocc‘s still in the mix, only now he’s exchanged the murky warehouse for the brightly lit DJ booth at KPWR, a.k.a. Power 106. Jurassic 5, fresh off their triumphant Smokin‘ Grooves show at the Universal Amphitheater, are tossing freestyles back and forth as J Rocc coolly bounces beats off the station’s new digital CD turntables. It‘s Friday Night Flavas, and J is hosting as part of the Fantastik 4our, alongside DJs Truly Odd, C-Minus and host Mr. Choc, the latter yet another Beat Junkie. At the same moment, across town, Junkies Icey Ice and Curse are presenting Seditious Beats on KPFK, while back downtown, Rhettmatic has taken over the mix for Banksy’s after-party. The Junkies are anywhere, everywhere in Los Angeles tonight. They don‘t belong to the city. The city belongs to them. 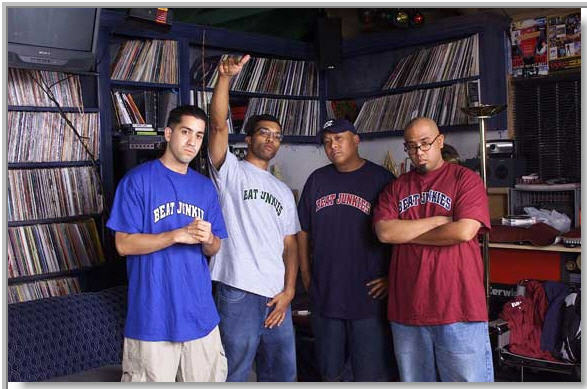 There has never been a DJ crew in any American city as dominant as the Beat Junkies, who celebrate their 10th anniversary on August 17. Since forming in 1992, the Junkies have helped anchor L.A.’s hip-hop scene in the clubs, on the radio and in retail, not to mention broken ground as innovative scratch DJs. True, the Bay Area‘s defunct Invisbl Skratch Piklz had more international prestige, and New York’s X-ecutioners have achieved more commercial success. But to conceive of what the Junkies have done in the ‘90s, you’d have to imagine New York‘s DJ kings of the ’80s — Red Alert, Marley Marl, Frankie Knuckles, Grandmaster Flash, etc. — all coming from the same neighborhood, forming a crew and staying intact for the next 10 years. And even then the comparison might not be adequate, since, at the end of their first decade, the Junkies are only getting better.